Before our trip I stumbled upon a comment on an Ireland travel forum that made mention of touring canals in a rented barge (basically a tiny houseboat designed for navigating canals). 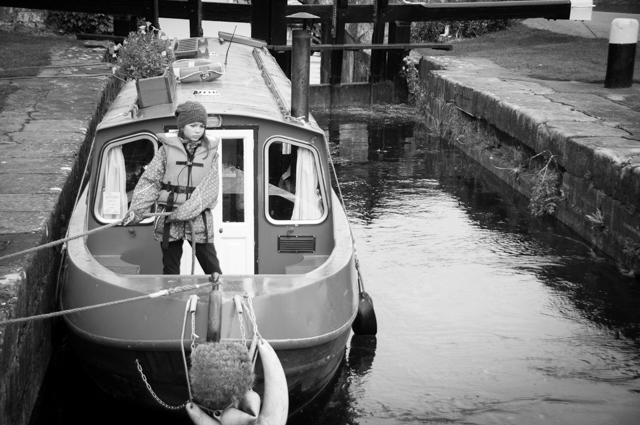 I dug a little deeper and found a family owned barge rental company with an opening during our stay in Ireland. As it happened, their vacancy aligned with the last four days of our trip. Four days, four people, one fabulous little boat. What could be better? Of course, as I am prone to be, I was anxious when we arrived. (The boat looked SO small! Too small to sleep four, certainly!) I paced about nervously waiting for the owner to arrive and walk us through. I had told him there were four of us, hadn't I? I had. We were early, so I had plenty of time to fret while we waited. Finally he arrived and my fears melted. There were three beds! Of course. And a full kitchen! And everything we could possibly need for four days on the water. My nerves turned to excitement as he walked us through the how-to's of steering, operating, and maintaining the boat. The barge is equipped with a full sized bed and two twin-or-smaller bunks, a full galley kitchen, a bathroom and a cozy little peat stove. Operating the barge also meant operating the locks that line the canal, something Sage in particular couldn't wait to get to work on. Built in the 1700's the locks have operated the same way since the boats using them were pulled by donkeys or horses from the trail alongside. How amazing is that? And for four days and four nights, this was home. Our last hurrah in Ireland, at just the perfect pace. Twice a keeper happened to find us moving through and happily lent a hand, but for the rest of our travels we were on our own. To be sure, there were mishaps along the way. (Please don't ask me about the shore-to-boat jump that went awry, leaving Sage and I both icing our legs and applying comfrey and yarrow poultices, nor that unfortunate incident that left us fishing the chimney out of the canal with the barge pole!) But truly I think our time on the boat was easily the most memorable part of the trip. Four magical days that none of us will likely ever forget. And with that, we're heading home. Home! To the States, to Wisconsin, to the Driftless, to our favorite hills just beyond our favorite creek. "Slán, Agus Beannacht de leath – Goodbye and God bless… any god!" See you stateside, friends. So soon! P.S. I nearly forgot! Several of you emailed for details on our rental. You can find them here. I can't recommend it enough. That looks amazing, thank you for sharing. What a cool idea. That looks enjoyable and about my speed when it comes to boats. Your photos are amazing! I am so happy you and your family launched off into the world on this adventure. Here’s to many more sunsets in interesting places. Great pictures! It’s a great vacation. The few Instagram posts were so intriguing, and this post satisfied so much of my curiosity about this dreamy sounding adventure! As if Ireland couldn’t rise any further on my list of desirable places, but your boat trip did just that! Your photos beautifully capture all the loveliness that Ireland possesses. All of the photos looks amazing. It’s obvious that you’re a pro. Great post. Thank you for sharing. Thanks to a true best friend Kili, I was delivered to this site and welcomed the discovery.